Jackson Police select December Employee of the Month. 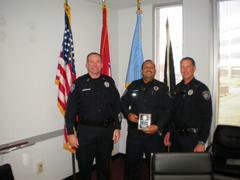 Jackson Police are pleased to announce Officer Kelly Mason as “Employee of the Month” for the month of December. 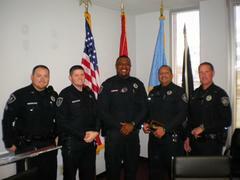 Officer Mason has seven years of service with the Jackson Police Department. He is currently assigned to the Street Crimes Unit of the Jackson Police Department. Officer Mason has been a tremendous asset to the Street Crimes Unit as well as the Jackson Police Department. Since his selection to the Street Crimes Unit, Officer Mason has earned two “Letters of Commendation.” His most recent commendation was from the results of a burglary ring operating in the Old Hickory area. Officer Mason turned a “knock and talk” into an Auto Burglary charge against the suspected ringleader. Along with his current assignment in Street Crimes, Officer Mason is also a critical part of the Jackson Police Department’s Aviation Unit as well as the Jackson Police Department’s Hostage Negotiation Unit. Officer Mason is a certified Drug Recognition Expert. Before coming to the Jackson Police Department, Officer Mason served twelve and half years as a Law Enforcement Officer in Florida (Broward County). Officer Mason has twenty-six years of service with the United States Coast Guard. He was recently promoted to the rank of Lieutenant Commander (O4 Grade) in the Coast Guard Reserves. Officer Mason has a wonderful family. Officer Mason and his wife have been married for twenty-two years and they have two children. When not at work, Officer Mason enjoys spending time with family and riding motorcycles. Officer Mason also enjoys grilling.